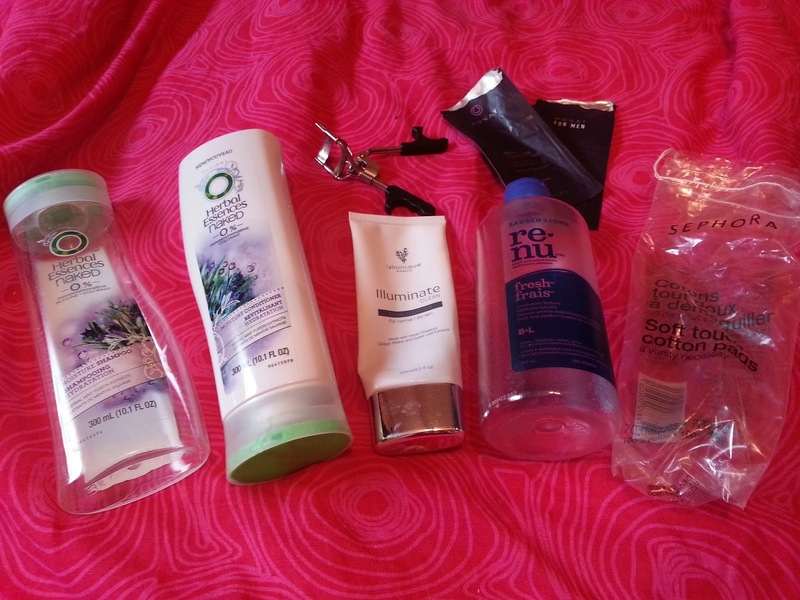 Deidre's Discoveries: October & November Empties! I know it's not the end of November yet, but I really wanted to get this done! I made an okay dent again in some products - I can't wait to get some more finished up. I have so much stuff and I really need to get through all the stuff! That's everything I got through. A decent size. 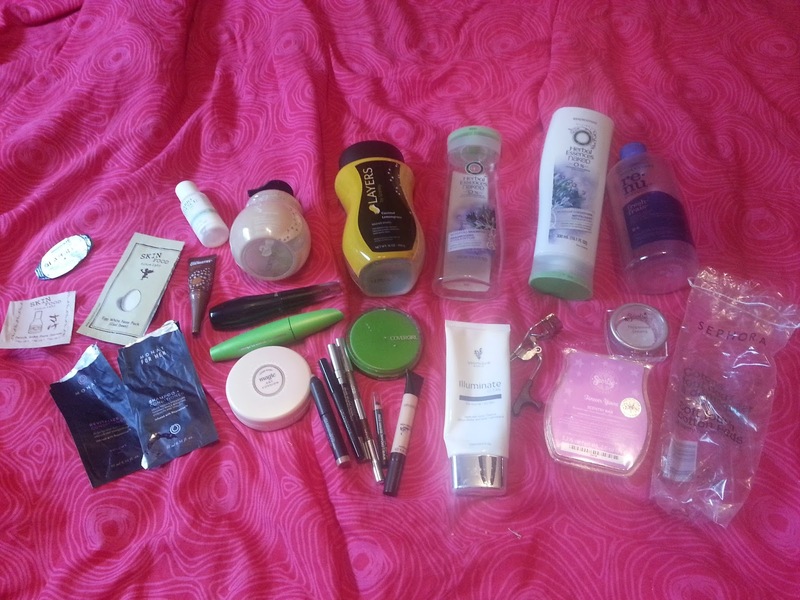 Well - everything was empty except some of the makeup... but I will explain more further down. Skin Food Egg White Nose Pack - This was pretty much a foam piece that is supposed to cool your nose down I guess, after using a nose strip. I didn't realize this until I did some research as I was wearing this. I didn't really notice any difference with the blackheads on my nose, and that's probably because I didn't use it properly lol. I think I have another sample or two, I will attempt it again after using a nose strip. Skin Food Peach Sake Pore Serum - this serum wasn't clear like most, but had a white tint to it. But it smelled amazing. It actually smelled like peaches! There was a generous amount for it being a sample. It made my skin smooth but it's not made for people with dry skin. It actually has some kind of mattifying powder. My hands felt powdery after using this. So if you have oily skin, it'd be perfect for you! Real Chemistry Luminous 3 Minute Peel - This stuff was just weird. I don't really do peels ever, so I didn't know what to expect. You use this while your skin is wet, apply it, and then with your fingers make circular motions all over your face. It balls up and it's supposed to be your dead skins cells. I didn't notice much of a difference when I used this, so I wouldn't purchase this. Mario Badescu Hydrating Hand Cream - This stuff was really thick and hydrating for dry hands and elbows. While I wouldn't purchase it - it was a great sample. 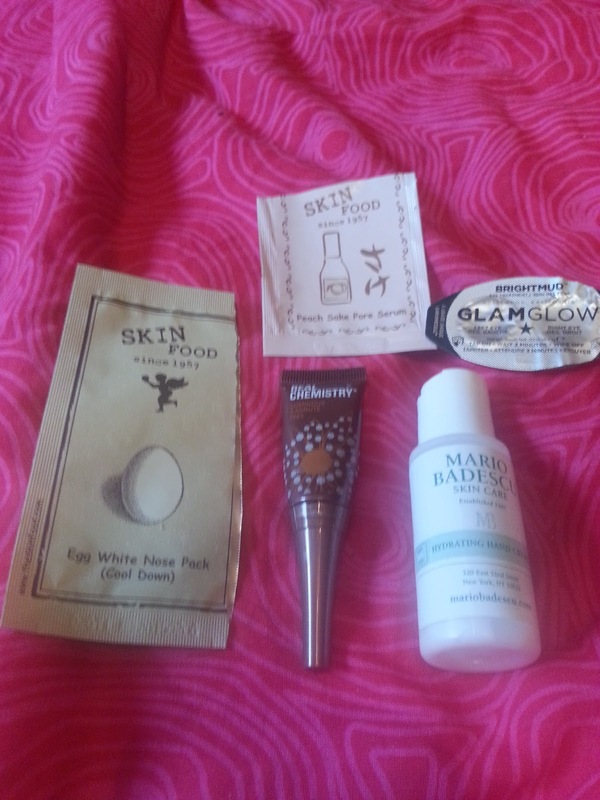 GlamGlow BrightMud Eye Treatment - I got this in an Ipsy bag. I think I may have done an empty post on this before. Anyway you apply it under your eyes, sit for about 5 minutes, then wipe it off. It also has a bit of a cooling sensation. I noticed that it didn't do anything for me and I wouldn't purchase this as full size. As you can see some of it isn't finished but some of it is really old and some I just really hated and wanted it gone..
Etude House Precious Minerals BB Compact - I never ordered this but it showed up in one of my online orders. I tried it out but it was like applying tinted water to my face. It was really light so didn't cover much and every single time I used it, it broke me out. So bye bye. CoverGirl Clean Pressed Powder in Ivory - this is the lightest shade they have, and it works for me. This is my usual brand of pressed powder. This was getting old though and started to break me out. I ended up purchasing a MAC pressed powder and had been using that more. Then one day I pulled out the CoverGirl and accidentally dropped it and whatever was left (not much) of the powder, shattered and went everywhere. So, it's empty now. I'll eventually repurchase this. CoverGirl Clump Crusher Mascara - I'm pretty sure I got this free from a P&G box that they send out every so often. I liked it, I'd purchase it in the future. It wasn't anything special, but it's good as an every day mascara, didn't clump, and didn't give me raccoon eyes. Good enough in my books. 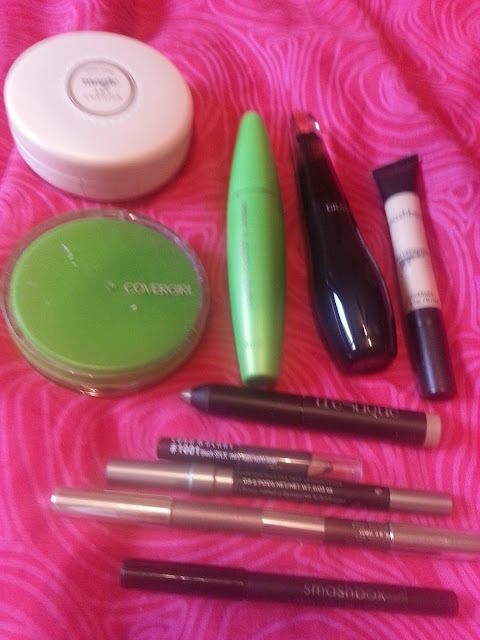 Lancome Grandiose Mascara - I got this free from Influenster probably a year and a half ago. It stinks, it's old, so I tossed it. Smashbox High Definition Concealer - I don't even know if they still sell this - it's that old. Anyway, I used it a few times in the past and never really liked it. I held onto it thinking maybe I could use it again some day and my opinion would change. It was put away and forgot about for years. Its old now, and I figured I probably shouldn't test it since it's so old. I wouldn't repurchase this. TreStique Eye Shadow Crayon - This came in Ipsy's June bag. I liked the colour I got but I went to apply it one day and the whole thing fell out. Not very useful. I tossed it because I got a similar one from Birchbox this month. Finally we have 4 pencil eyeliners. Lately I've hated using pencil eyeliners. I don't know what it is, but I'm just not a fan anymore. They're hard to apply, and sometimes they end up smudging so much cause sometimes I need to blink hard when my eyes are dry from my contacts. Here I have Lord & Berry, Urban Decay 24/7, a Clinique duo eyeliner with a dark brown and a taupe colour, and then a Smashbox pencil. Herbal Essences Naked - This is the shampoo and conditioner. I used to like it but I find it makes my scalp really dry, so I used up what I had left and won't be purchasing this again in the future. Younique Illuminate Clean - this is one of two facial cleansers that Younique offers. This one is for dry/normal skin. I like how creamy it is, but I don't like the price tag lol. But I like to support my friends so I purchased another not too long ago. I will probably use up some samples once this other one is done and then try something else. Re-nu Contact Lens Solution - Ugh. I'm not a fan of this solution. But it was on sale and our usual brand was sold out. I woudn't repurchase this. Eyelash Curler - I don't even know where I originally got this from (I have a suspicion that it was E.L.F) and the other day I was curling my lashes and I heard a SNAP! My curler broke :( I had a backup from Ipsy that I don't like but it works. It will have to do until I can afford to buy a new one. Monat Hair Sample - Replenish Conditioner and 2-in-1 Men's Shampoo - I'm not sure why she would send me a Men's shampoo when I told her it was for me. The sample was too small to make a decision as to how good it is. Sephora - Cotton Pads - I use these all the time to apply toner. The Sephora ones are good quality but a bit expensive for me. I only really purchased them because I needed a small amount in order to qualify for free shipping. Last but not least, some Scentsy things. Layers by Scentsy Hand Soap in Sugar Cookie - Scentsy recently discontinued their "Layers" line so I purchased some hand soaps before they were gone. This one is Sugar Cookie and is just a sweet vanilla scent. I liked it. I have some more to go through. Scentsy Tester in Peppermint Dreams - I don't have this bar and I felt like warming it... so I pulled out the tester and put it in my warmer. It smells like after 8 chocolates. It's nice! Scentsy Bar in Forever Yours - this is a discontinued scent of the month. It's a little floral, but it's also creamy. Layers by Scentsy Washer Whiffs in Coconut Lemongrass - I received these in my starter kit. I LOVE the washer whiffs that Scentsy offers. They are like those Downy Unstoppables, but they come in Scentsy scents. This wasn't my favourite scent but it did come through well in the wash.